AGCO's new Giant Spools allow all-day running without reloading twine. Owners of new generation large square balers from Massey Ferguson and Challenger have a new tool at their disposal for all-day baling -- without stopping to reload twine. 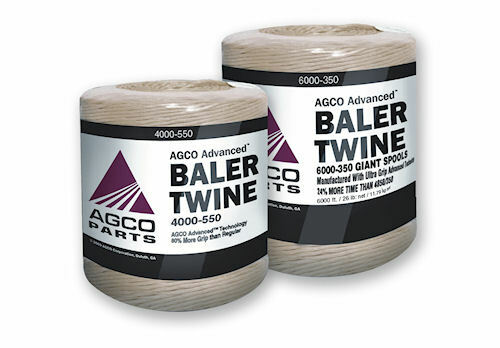 The new series of advanced baler twine from AGCO is called Giant Spools and are made using Ultra Grip technology that features AGCO Parts's strongest twine and a polypropylene mixture. The makeup of the twine reduces slippage and forms a firm, powerful knot with 80% more grip at the knot than regular twine. Boost your running time by nearly 40% with Giant Spools that cut down time on the baler to reload twine.